A rubric is a set of marking criteria that can be used to make marking easier and more consistent. You can also use a rubric to clarify what is expected from students and to give them feedback. 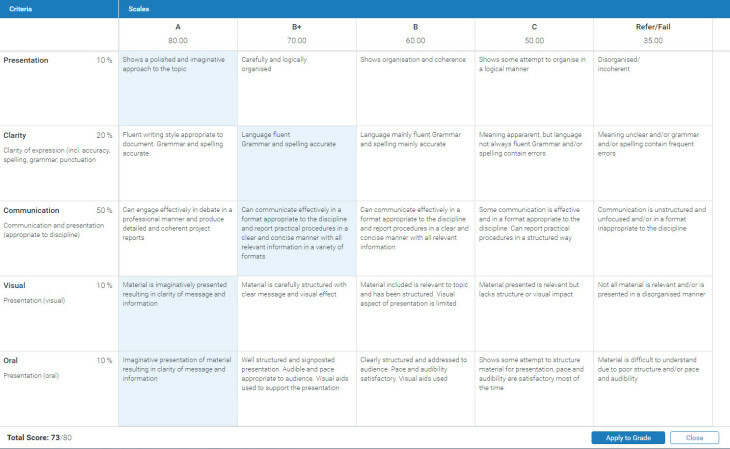 GradeMark has rubrics that allow you to assign marks as well as qualitative rubrics for feedback only. 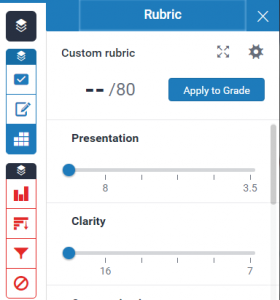 There are also simple rubrics called Grading Forms that allow you to enter feedback and optionally marks for a set of criteria. Rubrics can be useful when you have a group of people doing the marking, as they help to make the marking more consistent. 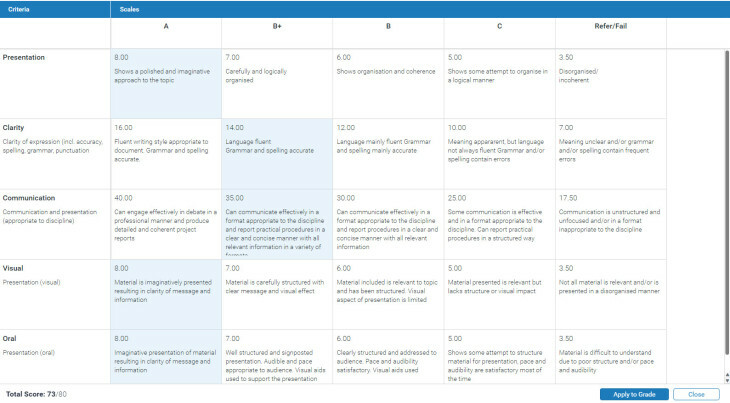 For certain types of marking you can use a rubric to generate the final mark, which saves you time. They also let the student see where they fall in the range of achievement. You can find instructions on how to set up rubrics on Turnitin’s website. Qualitative – feedback only, no scoring. For a simpler option, you could consider using a Grading Form instead. Qualitative rubrics provide feedback only, no marks. They are quite straightforward to set up, you just enter the criteria and levels of achievement and specify feedback for each combination. The main limitation is that there are only a small number of characters available for the criteria names, but you can add more details underneath. The hard bit is writing the criteria and associated feedback, but that’s a topic for another blog post. For a standard rubric, you enter a score for each column, that can be scaled by a percentage for each row. When you select a cell, GradeMark multiplies the column score by the row percentage and adds them up. So in the example below, the total score of 73 was calculated as (0.1 x 80) + (0.2 x 70) + (0.5 x 70) + (0.1 x 80) + (0.1 x 80). You can choose to apply the calculated score to the grade, or you can overwrite it and enter a different grade. I think it’s quite difficult to work out how you want to allocate the scores in a standard rubric, because each column can only have one mark associated with it. So for example if you have a column for a 2.1 level, you may want to assign a mark varying between say 70% and 80%, but you have to pick just one mark. The solution is probably to make the criteria sufficiently detailed that you can assign just one mark for each column and then total them to calculate your overall grade. This can save the markers quite a bit of time. A custom rubric is another quantitative rubric that can calculate marks, but this time you can enter a different value for each cell (but again only one value per cell). This gives you a bit more flexibility, as you can vary the scores between rows, but I think the criteria would still need to be quite detailed in order for this to be usable. Rubrics such as this have been used to mark short questions where each question can be given between 1 and 8 marks. In this case each row was a question number and the columns were numbers 1 to 8. Grading forms are much simpler, just a list of criteria for which you can add your feedback and, optionally, a mark. They can be useful to structure feedback and make sure all areas are covered. In summary, GradeMark rubrics can be useful in providing feedback to students. They can save time when used to calculate marks but this needs careful planning.